Balanced against the need for prophylaxis to prevent a catastrophic complication is the understanding that a too-aggressive protocol for DVT prophylaxis will put the joint replacement patient at risk for bleeding, hematoma, and wound issues – which could lead to a perioprosthetic joint infection. 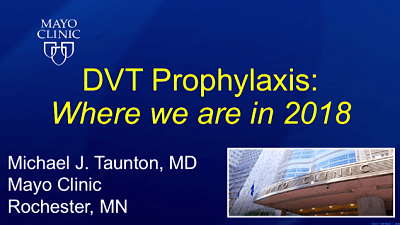 The answer, said Michael J. Taunton, MD, is a patient-specific approach to DVT prophylaxis that balances safety and efficacy, taking into account patient and surgical factors such as the length of the procedure, the use of a tourniquet, and the surgical approach. What’s more, he said in a presentation at the ICJR South Hip & Knee Course, orthopaedic surgeons must take the lead in determining what’s best for their joint replacement patients, working in partnership with their medical colleagues. It will be several years before orthopaedic surgeons have any answers, though: This ongoing study is scheduled for completion in 2021. Click the image above to watch Dr. Taunton’s presentation. Dr. Taunton has no disclosures relevant to this article. Johnson R, Green JR, Charnley J. Pulmonary embolism and its prophylaxis following the Charnley total hip replacement. Clin Orthop Relat Res. 1977;(127):123-32. Spyropoulous AC, Lin J. Direct medical costs of venous thromboembolism and subsequent hospital readmission rates: an administrative claims analysis from 30 managed care organizations. J Manag Care Pharm. 2007 Jul-Aug;13(6):475-86. Mont MA, Jacobs JJ, Boggio LN, et al. Preventing venous thromboembolic disease in patients undergoing elective hip and knee arthroplasty. J Am Acad Orthop Surg. 2011 Dec;19(12):768-76. Comparative Effectiveness of Pulmonary Embolism Prevention After Hip and Knee Replacement (PEPPER). ClinicalTrials.gov identifier NCT02810704. Accessed July 24, 2018. Next articleWhy Did These TKAs Fail?